The mission of the campaign is to bring together the body of Christ in a spirit of unity during a focused 40 day campaign of prayer, fasting, and peaceful activism, with the purpose of repentance, to seek God’s favor to turn hearts and minds from a culture of death to a culture of life, thus bringing an end to abortion. 40 Days for Life takes a determined, peaceful approach to showing local communities the consequences of abortion in their own neighborhoods, for their own friends and families. It puts into action a desire to cooperate with God in the carrying out of His plan for the end of abortion. The 40-day campaign tracks Biblical history, where God used 40-day periods to transform individuals, communities ... and the entire world. From Noah in the flood to Moses on the mountain to the disciples after Christ's resurrection, it is clear that God sees the transformative value of His people accepting and meeting a 40-day challenge. Want to end abortion? If you do, the first thing you must do is pray. Prayer is at the center of 40 Days for Life. During each campaign, we are calling on prayer warriors across the nation ... and around the world ... to fall on their knees before the Lord, asking Him to hear our plea and heal our land. Pray outside an abortion facility. Pray at church. Pray at work. Pray in the car. Pray at home with your family. 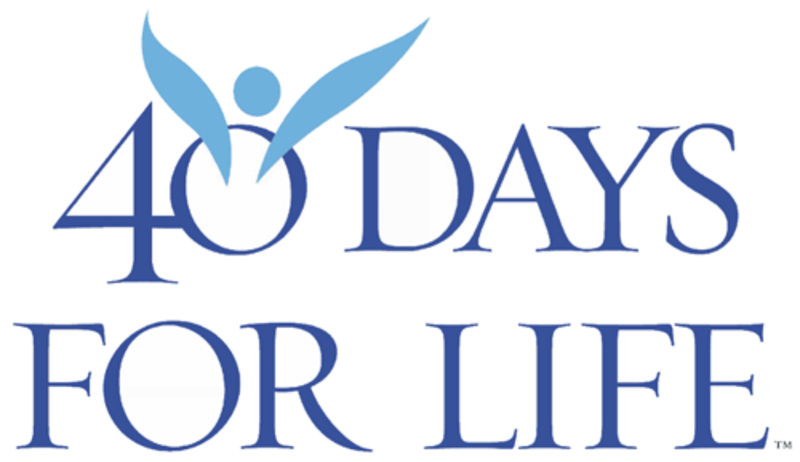 Each day during 40 Days for Life, individuals, churches, families and groups will be asked to join together in prayer for a specific request so the entire Body of Christ can unite around a common focus. People of faith are also invited to fast throughout 40 Days for Life. Christ said there are demons that can only be driven out by prayer and fasting. A fast is not a Christian diet; it is a powerful means of drawing closer to God by blocking out distractions. Fast from certain foods. Fast from television. Fast from apathy and indifference. Fast from whatever it is that separates you from God. During 40 Days for Life, the pro-life message is taken proactively to every corner of your community. Media outreach is conducted through carefully targeted news stories, talk shows, editorials and opinion pieces. This enables you to get the pro-life message out to many people who would never see the inside of a local church.